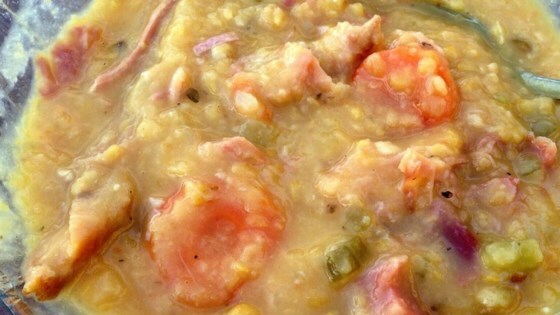 "Creamy yellow pea soup studded with bits of ham, carrots, celery, and thyme. There is nothing like this one on a cold day! I am a Canadian now living in the US. and cannot get Habitant® soup anymore, so I came up with this version. I think it is as good as the real thing, if not better, because it is homemade." Place split peas, ham bone, carrots, onion, celery, thyme, bay leaf, salt, and pepper into a large pot; pour in water. Bring mixture to a boil and skim off any foam with a spoon. Reduce heat; place a lid on the pot slightly ajar to allow some evaporation. Simmer, stirring occasionally, until peas are tender and soup is thick, about 3 hours. Remove ham bone from soup; strip meat from ham bone, chop meat, and return it to the pot. You can substitute 2 smoked pork hocks or 1 small ham shank for the leftover ham bone. Adjust thickness of soup by adding a little water to thin or remove broth with a spoon for a thicker soup. I sometimes use an immersion blender for a quick second to blend the soup, making sure to leave some chunky peas, carrots, celery, and ham. Excellent old fashioned recipe! I left the ham bone in during the cooking process to enhance the flavor. Thanks for sharing! This is exactly how I remember split pea and ham soup. Very French and extremely delicious! I agree, you don't need to add salt - the ham is salty enough. I also add a few cloves of garlic.